Conestoga entrepreneurs pitched their original business ideas to a panel of judges at the college’s annual pitch competition held March 28 at the Gaslight District in Cambridge. 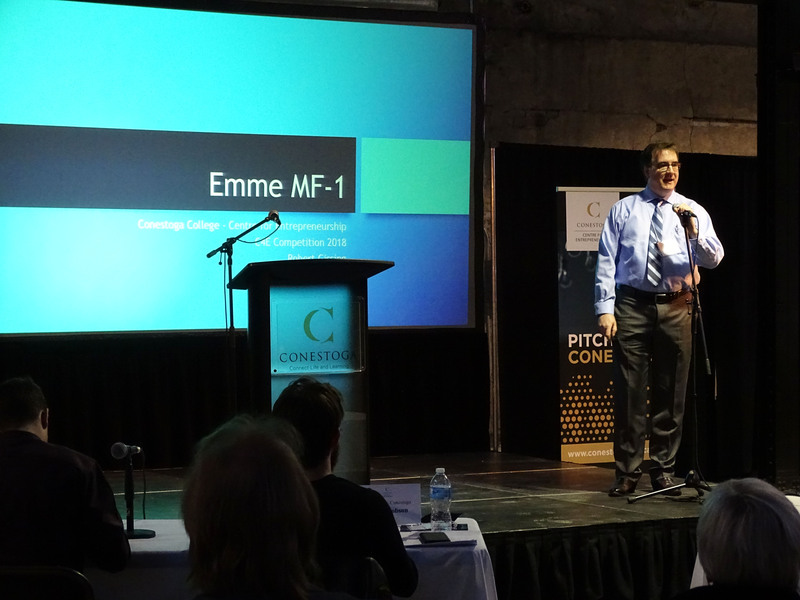 Robert Gissing received a $1,000 prize for his Emme Multiform concept at Conestoga’s annual pitch competition. Robert Gissing, a student in the Mechanical Systems Engineering (MSE) degree program, and Phil Karasinski, a graduate of the Mechanical Engineering Technology - Design and Analysis diploma program, both won cash prizes for their innovative ideas. Pitch Day at Conestoga, now in its fourth year, is hosted by the college’s Centre for Entrepreneurship (C4E) and is open to all participants in programs delivered by C4E. Six finalists were drawn from C4E’s workshops and Enterprise Catalyst program and were given just three minutes to present their ideas. Judges included Stephen Bacso and Conestoga graduates and entrepreneurs Jesse Hambly, James Hobson and Stephanie Soulis. Gissing, an amateur tailor, received a $1,000 prize for his pitch in the C4E category. His Emme Multiform concept is a networked animatronic model that adapts to various body shapes and sizes that tailors can use to assemble a garment. Karasinski, a C4E Enterprise Catalyst client, won $2,500 for his startup called Load Army - an app-based business that allows contractors to order sand, soil and gravel and have it delivered directly to a job site at a reasonable price. Hobson, a 2012 MSE graduate who launched his own successful YouTube channel to inspire others to pursue careers in science, technology and innovation, delivered the keynote presentation. Also known as The Hacksmith, he has more than 2.5 million subscribers on YouTube where he documents the creation of functional prototypes inspired by fictional ideas in comic books, movies and video games. John Stix, co-founder of Fibernetics, one of Canada’s largest telecom and internet companies, also shared his insights and experiences as an entrepreneur. Conestoga graduates own more than 3,500 local businesses, ranging from single proprietorships to enterprises with hundreds of employees. C4E provides opportunities for students from a wide range of programs to prepare for future success through engagement in applied research, innovation and commercialization activities.